Ever heard of Palak Paneer? 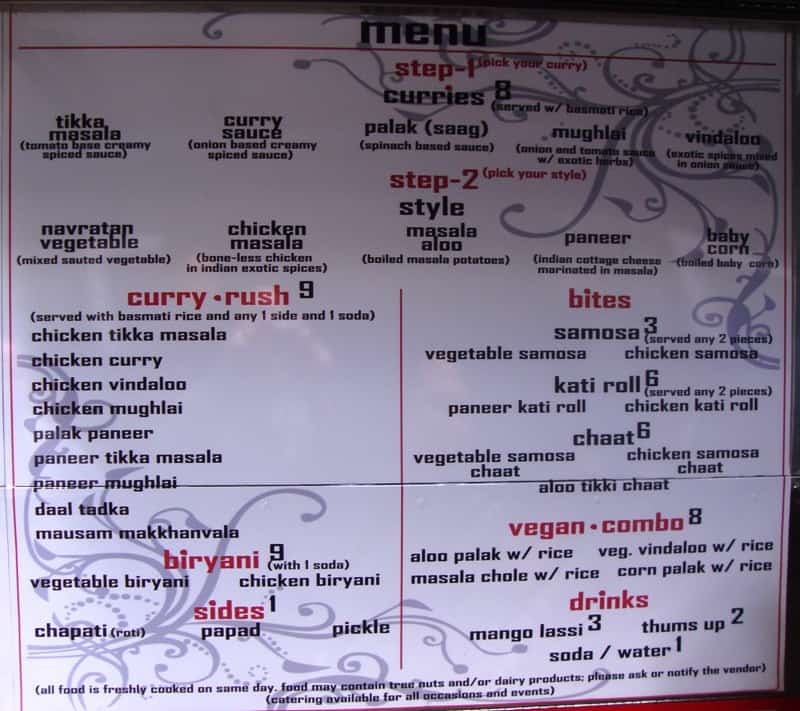 Well, the Mausam Curry N Bites truck is only about 3 months old, so we’re still working our way down the menu, till we found it. Chicken vindaloo and chicken curry were had on our 1st & 2nd visit, respectively. Time to mix things up and try a veggie dish this time. Indian cuisine is vegetarian-friendly, with plenty of options for the meat-averse. It’s funny how your tastes change as you get older. Growing up, we hated spinach, but now we like it. Same thing with onions, mushrooms, coconut, and the latest formerly-despised food to cross over to our good side, beets. But we digress. Lunch was palak paneer, also known as saag paneer. This spinach-based dish cost $8 by itself or $9 for the “Curry Rush”, a meal that comes with a side dish and a soda. One of the best things about the Curry Rush special is the side dish. Most of Mausam’s food has lots of sauce, and chapati bread is great for scooping up rice, sauce, and chunks of paneer (or chicken). Paneer is an Indian style cottage cheese. It’s solid, but still soft to eat, and is quite mild. Most paneer we’ve had has been white, but you can see this paneer was marinated in masala and had a pinkish-orange color. We always enjoy finding and eating pieces of paneer wading in the saag, the spinach-based sauce. Digging into the saag, we were surprised that it was a bit on the boring side. Not sure if they couldn’t find the salt shaker that day, or if it’s usually this bland. The saag we’ve had at other Indian places had more in the way of flavor and seasonings. It’s possible the spinach sauce seemed bland because the rice was so fragrant. They do a nice job seasoning the basmati rice. There was a bunch of fresh cilantro topping the dish too, which is aromatic as well. As we said, the chapati bread is tasty. Tearing off pieces of it to scoop up saag, paneer and rice helped bring up the flavor of the saag too. That’s what happens when you work your way down a menu – some dishes are better than other. At Mausam Curry N Bites, our favorite dish so far has been the chicken vindaloo, but that’s just our opinion. Yours may be different. Find out for yourself by tracking Mausam Curry N Bites down on twitter here or our Mobile Munchies twitter feed. You can see their full menu here. How to Equip Your Food Truck Kitchen? After posting this review, we heard from Mausam Curry N Bites. Sam said the palak sauce can be bland, as it has no onions or garlic. It is made that way intentionally for Jain Indians.